I’ve been mildly obsessed with the street-name comparison tool from ITO World over the last couple of weeks. It measures how many correctly named roads OpenStreetMap has in the UK by comparing it against the Ordnance Survey’s OS Locator dataset. We also get to mark where corrections are needed in the OS data – even they aren’t perfect! According to the combination of the OS data combined with our list of corrections, OpenStreetMap (and hence OpenCycleMap) today has 600,414 correctly named streets – just over 70% of the total. What’s more, in the last week alone we added 4,699 more streets – in the last 31 days we’ve added a whopping 19,309. If we keep this up we’ll be done in about 13 months, but I hope we can up the rate even further. Every time a London area gets beyond 95% – i.e. turns blue on the map – we’ll have a celebratory pub meetup in that area. We discussed this at the last pub meetup (although Harry is being a bit harsh if we’re going to wait for 100%, I reckon 95% is close enough for now!). Not counting those that are over 95% already, we’ve had our first winner – Barking and Dagenham! Congratulations to all involved, and I invite someone to step forward and nominate a nice pub for the rest of us to come and visit. If Barking seems like a bit of a trek for you to get to, then that’s the motivation to improve areas closer to home! 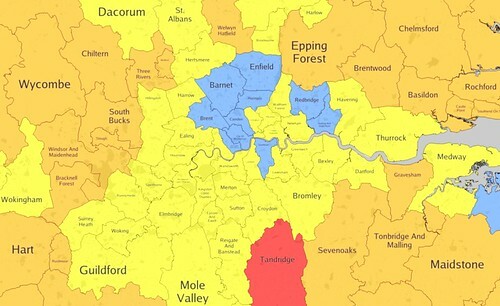 For the record, there were 9 areas already blue before I opened the challenge – Redbridge, City of Westminster, Camden, Brent, Southwark, Kensington and Chelsea, Barnet, Enfield and Haringey. Perhaps these areas can be opened to the 100% challenge instead! This entry was posted in Uncategorized and tagged General on February 2, 2011 by Andy.